Image caption Mr Erdogan said there were "massacres" in Algeria where Algerians were "burned en masse in ovens"
The Turkish prime minister has accused France of committing genocide during its colonial occupation of Algeria. Recep Tayyip Erdogan was speaking after French MPs passed a bill making it a criminal act to deny that Ottoman Turks committed genocide in 1915-16 Armenia. He accused President Nicolas Sarkozy of using the bill to fan hatred of Muslims and Turks for electoral gain. He said Mr Sarkozy should "ask his father, who served in the French Legion there" about the Algerian "massacre". Ankara has already recalled its ambassador to France and frozen political visits and joint military projects over the bill. 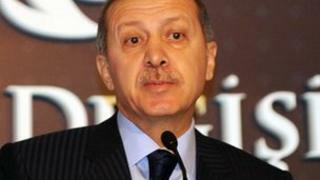 And Mr Erdogan has warned he will take further unspecified steps. "In Algeria from 1945, an estimated 15% of the population was massacred by the French. This is a genocide," he said. "The Algerians were burned en masse in ovens. They were martyred mercilessly." He added: "The vote in the French parliament has shown how dangerous racism, discrimination and Islamophobia have become in France and Europe." If passed into law, Thursday's bill would mean anybody who publicly denied the Armenian "genocide" would face a year in jail and a fine of 45,000 euros (£37,500; $58,800). Mr Sarkozy has hinted the bill has his approval, though his Foreign Minister, Alain Juppe, has described it as useless and counter-productive. There are some 500,000 voters of Armenian descent in France and they are seen as a key source of support for Mr Sarkozy. Armenians say up to 1.5 million people were killed by the Ottoman Turks in 1915-16. Ankara says closer to 300,000 people died, and that Turks were also killed as Armenians rose up against the Ottoman Empire when Russian troops invaded eastern Anatolia, now eastern Turkey. More than 20 countries have formally recognised the killings as genocide. France invaded Algeria in 1830 and it remained under French rule until independence in 1962. The number of people killed in the eight-year independence war from 1954-1962 varies widely according to different sources, ranging from 300,000 to more than one million.